55 years ago today mankind first glimpsed the far side of the Moon. You're looking at that first grainy image of an unknown landscape. 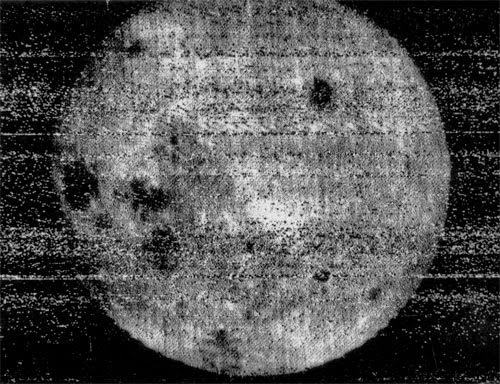 The first photograph of the far side of the Moon, taken on October 7th, 1959 by Soviet spacecraft Luna 3. On October 7th 1959, Soviet spacecraft Luna 3 ventured further than any previous spacecraft and first imaged the far side of the Moon. Luna 3 snapped a total of 29 images of the sunlit, mountainous landscape from a height of about 65,000 km above the surface over a period of 40 minutes. 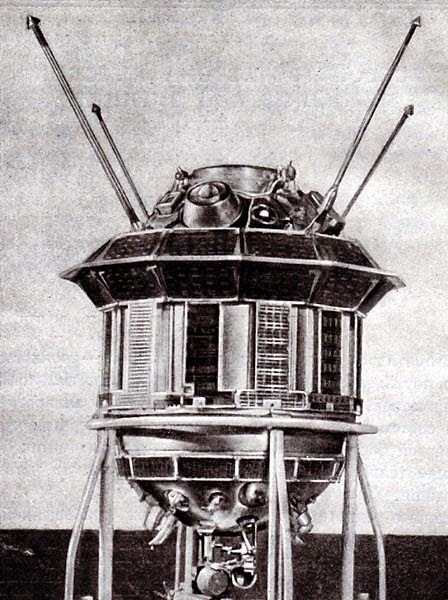 Once Luna 3 emerged on the other side of the Moon, it attempted to transmit the images back to Earth but encountered problems with unexpectedly low radio signal strength. Then ensued ten days fraught with the attempts to transmit the precious images while Luna 3 travelled back towards Earth. Finally on October 18th, the U.S.S.R managed to receive 17 very noisy images of the lunar far side. But they were enough to spark public fascination and, what's more, caught the attention of astronomers. The Moon's far side looks dramatically different from the side that faces Earth; this was evident even in the low resolution images from Luna 3. The far side of the moon has a distinct lack of the dark 'mares' that give the near side of the Moon its familiar face. Instead, the far side appears lighter and pockmarked with countless small craters. Images from the Clementine spacecraft in 1994 highlight this stark difference between the two faces. Scientists are still debating why the far side looks so different. We know that the lunar crust on the far side is thicker than on the near side so perhaps this prevented meteorite impacts from breaking the crust and spilling lava out into dark flows. But the question remains as to why the far crust is thicker. It might have something to do with the fact that the Moon is tidally locked with the Earth, but we don't know for sure. Even today, the far side holds fascinating mysteries. These days lunar satellites such as NASA's Lunar Reconnaissance Orbiter make imaging the far side of the Moon routine. But only 24 humans have ever laid eyes on it. The first time was by the crew of Apollo 8 in 1968 and the last time was in 1972 by the Apollo 17 crew. The 24 Apollo astronauts that spanned these missions still hold the record for having traveled the furthest from home than any other human being on Earth. Apollo 8, 10, 11, 12, 13, 14, 15, 16, 17 by 3 makes it 27 people. I'm glad someone's checking the math! The trick here is that three of the Apollo astronauts actually flew to the Moon twice. John Young flew Apollo 10 and 16. Eugene Cernan flew Apollo 10 and 17. And Jim Lovell flew Apollo 8 and 13 (but sadly never landed). So 24 people in total have been to the Moon.